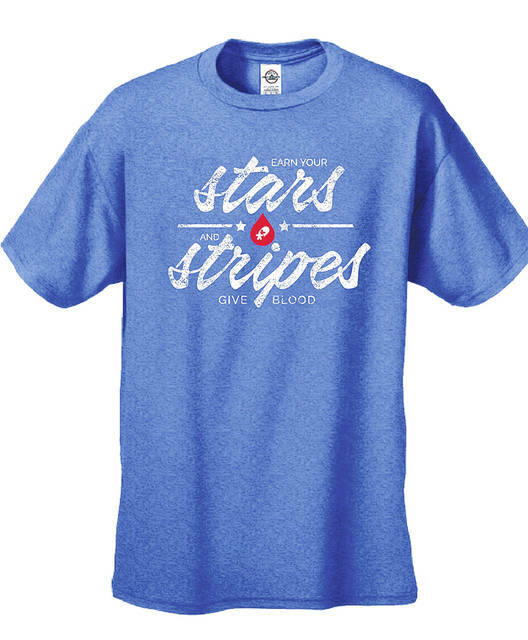 Everyone who registers to donate blood at the Vandalia Justice Center blood drive on July 13 will receive the patriotic “Earn Your Stars and Stripes - Donate Blood” t-shirt. VANDALIA — The City of Vandalia Justice Center is asking donors to help “Build a Better Summer Blood Supply” by supporting their community blood drive Friday, July 13 from 9 a.m. to 1 p.m. in the community training room, 245 James Bohanan Drive, Vandalia. Donors are encouraged to schedule an appointment online at www.DonorTime.com or call 1-800-388-GIVE. Everyone who registers to donate will receive the patriotic “Earn Your Stars and Stripes – Donate Blood” t-shirt. Everyone 18 and older will be automatically entered in the Community Blood Center “Build a Better Blood Supply Summer Blood Drive” drawing to win a $5,000 home improvement gift card. Summer activities and travel often disrupt donation schedules and can impact the blood supply. If you must miss an appointment to donate please reschedule when you can. Everyone who registers to donate blood at the Vandalia Justice Center blood drive on July 13 will receive the patriotic “Earn Your Stars and Stripes – Donate Blood” t-shirt.